Saturday, November 17, 2012, @ 5:00pm, QUEENS. 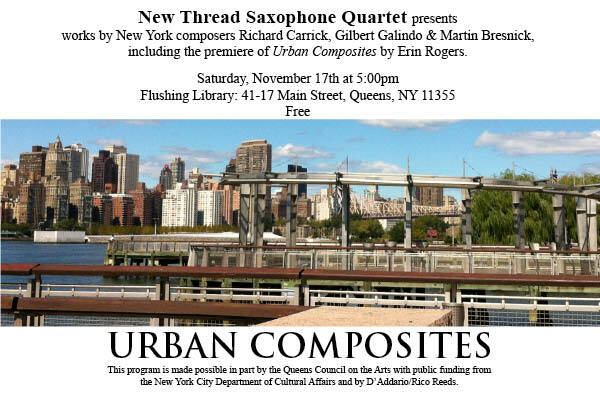 The New Thread Saxophone Quartet presents the premiere of Urban Composites by Erin Rogers at the Flushing Library, 41-17 Main Street, Flushing, NY 11355. The work depicts various urban landscapes in Queens within a full length, multi-sectional chamber piece. New Thread will frame the program with selections by New York based composers. Founded in 2011 in New York City, the NEW THREAD QUARTET is committed to the creation and performance of saxophone quartet repertoire from New York’s burgeoning new music scene. Members of the ensemble are active as composers, performers, educators, and industry professionals and hold degrees from the most prestigious conservatories and music schools in the US and Europe. In its inaugural year, New Thread presented 5 concerts of works by New York composers, with performances at George Mason University, Fairfax, VA, SUNY Potsdam, Arizona State University, Tempe, AZ, and locally at South Oxford and Vaudeville Park, Brooklyn. The New Thread Quartet was selected from an international pool of saxophonists and performed at the World Saxophone Congress 2012, in St. Andrews, Scotland. This program is made possible in part by the Queens Council on the Arts with public funding from the New York City Department of Cultural Affairs and with support from D’Addario/Rico Reeds. You are receive this e-mail in response to your recent purchase at Library of Congress. To get started, simply make Art and sent to us . and sign-up today! SPAM makes experimental performance easy AND mingle with like-minded enthusiasts. When and where you want! You can respond FREE for 30-days and there is no contract. THINK ABOUT “ASSEMBLY” THEN MAKE A SET OF PERFORMANCE INSTRUCTIONS, A SCORE, TEXT, EVEN AN IMAGE, PATCH, OR PROGRAM… WHATEVER. BUT SEND TO thingNY@gmail.com BY OCT. 26, 2012 AND PLEASE FORWARD THIS EMAIL TO FRIENDS, FAMILY AND COLLEAGUES. directed by Miguel Frasconi (glass, electronics). Daniel Goode (clarinet), Kathleen Supové (piano), Chris McIntyre (trombone), Cristian Amigo (guitar), Richard Carrick (guitar), David Watson (bagpipes), Sara Schoenbeck (bassoon), John King (viola), Erin Rogers (sax), Guy Barash (computer), Shannon Fields (voice), Raz Mesinai (beats), Paul Pinto (voice), Damon Holzborn (ipad), and special guest TILT Brass (Gareth Flowers, Tim Leopold, Chris DiMeglio – trumpet; Jen Baker, Will Lang, James Rogers – trombones; Chris McIntyre – conductor). Celebrating the composer on the day of his birth, 100 years ago. Pieces will include Sonata for Clarinet (1932), In a Landscape (1948), Fontana Mix (1958), Aria (1958), Music for Amplified Toy Pianos (1960), Variations II (1961), Atlas Eclipticalis (1962), Solos from Song Books (1970), Child of Tree (1975), c Composed Improvisations (1990),and an ensemble performance of 4’33” (1952). Sweet Soubrette returns to LIC Bar!